Many of the fitness apps available for download in the App Store try to cover different aspects of your workout regime, from offering instruction videos to counting the calories you’ve consumed and burned. Pocket Workout, in contrast, is only concerned with one thing—tracking your workouts and measuring your progress toward a stated goal. Sticking to Schedule: After you set your target goal in Pocket Workout, you also set a workout schedule, including what days you’ll workout, what exercises you’ll do, and how long your program will continue. In that sense, Saltlick Labs’ $2 app is a sort of computerized personal trainer. The developer even calls the main part of its program the “personal trainer,” acknowledging Pocket Workout’s focus. But this personal trainer isn’t right for everybody. Pocket Workout seems geared toward intermediate users people that already know how to perform calisthenic exercises. The app does not provide any instructions on how to perform any of its nine workout routines—no written commands, no photos, and no videos. There’s not even a Web link to definitions, so users wondering what “kick backs,” “wide pull-ups,” or “flutter kicks” are—let alone how they’re performed—will have to conduct that research on their own. To be fair, Saltlick Labs makes this all clear on Pocket Workout’s App Store page; still, the omission of even a simple description or some type of illustration limits the utility of this app for some users. That said, if you know how to perform basic calisthenics, Pocket Workout can help you along as you chart your progress. When you first launch the app, it asks you to setup your personal trainer. You enter your current vitals—height, weight, and BMI—and take “before” photos for comparison purposes. After you set your vitals, you’re ready to get started with the personal trainer. 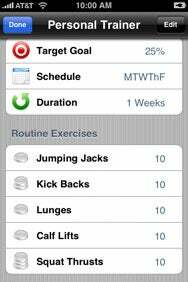 Every workout in Pocket Workout is designed around a target goal and a schedule. After you set a target goal, you also set a schedule with the number of times per week you want to work out and the number of weeks you want to continue working out. Pocket Workout includes a thorough help file to walk you through any questions about the setup of the personal trainer. Workout plans may last for as little as one week or as long as one year. All workouts are comprised of different exercises—you can choose as many or as few as you’d like. You can add exercises from Pocket Workout’s database, where they’re divided by difficulty, or you can enter your own exercises. Adding exercises is easy, though I couldn’t find a way to remove any from the database. The ability to add multiple individual exercises to a single workout plan is a key feature of Pocket Workout, since the app can only remember one complete schedule at a time. Still, Pocket Workout does keep track of all your goals, targets,and vitals as you complete your workout schedule. The app provides charts to graph your progress in each category: weight, BMI and so forth. Pocket Workout also includes Twitter integration via a “motivation” page full of tweets from other users using the software to track their workouts. You can tweet your progress right from within Pocket Workout. Pocket Workout is an ideal application for business users or frequent travelers that are already familiar with these types or exercises. Beginners will likely want to see examples of how the exercises are performed, something you’ll find in an app like iFitness ( ), but not in Pocket Workout at this time. Still, Pocket Workout delivers what it promises—it’s a good exercise tracking tool for intermediate users or anyone that already exercises and wants an effective way to chart their progress. Pocket Workout is compatible with any iPhone or iPod touch running the iPhone 2.x software update.